The next International conference on Computer Applications and Quantitative Methods in Archaeology (CAA 2017 – http://caaconference.org/) will be held between March 14th and 16th, 2017 at Georgia State University in Atlanta, GA, USA. Over previous decades many advances in archaeology and contemporary urban geography have been made using computational and quantitative methods to study cities and their built environments at various stages of development. In recent years the proliferation of new approaches allowing for the documentation and analysis of built spaces have enabled the acquisition of large volumes of data on ancient settlements encouraging fresh lines of enquiry. Advances in data acquisition via geophysics and remote sensing methods have offered a more comprehensive picture of cities, towns, and villages in two, three, and sometimes four dimensions. These developments have contributed to better understanding of the form, size, and spatial configuration of past settlements, and have facilitated their interpretation through various forms of computational analysis. Methodologies such as Space Syntax, 2D and 3D GIS based analysis, spatial interaction models, network analysis, and urban scaling have been employed to explore socio-economic aspects of culturally diverse settlements at different spatial scales. These studies demonstrate the potential of computational methods to offer insights into the social organisation of past societies, often from a comparative and interdisciplinary perspective, as well as the challenges entailed in applying these methods to fragmented archaeological datasets. This session invites papers that discuss the use of computational methods for the acquisition and analysis of settlement data at the micro (building), meso (settlement) and macro (regional) scales. We especially welcome papers on the innovative applications of 2D and 3D spatial analyses to the built environment, works that adopt a comparative and diachronic perspective, and studies that seek to evaluate the theoretical contributions and challenges associated with the use of these computational approaches. The call for papers and posters is now open and will remain open until 11:59 PM EDT the 28th of October (Friday). To submit your paper abstract please go to the OCS website to log-in. Already looking forward to attending CAA 2016! This session seeks to stimulate the discussion between different analytical approaches to the ‘Ancient City’, ranging from macro-scale analysis (including the exterior peripheral environment) to the micro-scale analysis of individual houses and interior spaces. Since the 1990s archaeologists have been employing computer-based quantitative analysis tools to reconstruct not only cultural landscapes and rural settlements, but also urban built environments. These analysis tools and software solutions have been improved over the last decades, allowing us to advance our knowledge of the ‘Ancient City’ beyond descriptive digital models and constraining conceptional boundaries. The aim of this session is to push the boundaries of current applications to open up new ways of studying and understanding Ancient Cities, and to work towards a shared set of analysis techniques and interpretative frameworks that can be applied to most past built environments across most time-scales. We would like to invite contributions that discuss innovative aspects of computer applications to the research of past urban developments, which may include, among others, computer simulations of urban development in the past, 3D reconstructions of urban environments, large-scale analyses of urban social / cultural phenomena, innovative Building information Modeling applications (BIM), 3D/4D, and GIS. We particularly welcome papers that explore the interpretive potential of new computational approaches to ancient urbanism and encourage debate on the theoretical and methodological issues that come along with the application of digital technologies for the understanding of ancient cities. 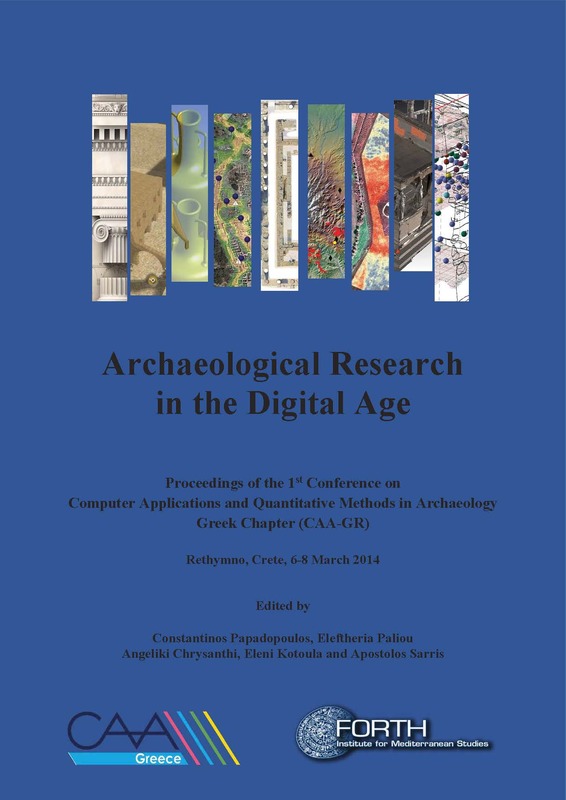 The e-proceedings of the CAA GR 2014 conference are out! Papadopoulos, C., Paliou, E., Chrysanthi, A., Kotoula, E., and Sarris, A. (Eds) 2015. Archaeological Research in the Digital Age. Proceedings of the 1st Conference on Computer Applications and Quantitative Methods in Archaeology Greek Chapter (CAA-GR) Rethymno, Crete, 6-8 March 2014. Rethymno: IMS-Forth. The second volume of the CAA 2012 proceedings was published a few days ago and is freely available from this link. The volume, that covers the full breadth of computer applications in archaeology, also includes a paper I co-authored with Cristina Corsi, while I was working at the “Radiography of the Past” project. The paper offers a brief account of how computational methodologies have been used to enrich the interpretation of archaeological datasets collected mainly via non-destructive multy-survey methods at the Roman site of Ammaia. GIS-based data integration, data fusion, 3D reconstruction and visualisation are briefly discussed, while emphasis is given to the yet largely unexplored potential of urban network analysis to enhance the interpretation of ancient street networks revealed with non-destructive survey methods. A high resolution pdf of the paper is available from this link. More results on this work will be published in a forthcoming publication. Additional informaton on the archaeological work undertaken at Ammaia can be found on the website of the project, including a full publication list. Furthermore, a booklet and dvd on Ammaia have been made available via the website of the project and can be downloaded for free. Within archaeology, computer-based spatial analysis (for example, GIS-based analysis) has been widely applied to the investigation of historic and prehistoric space, both domestic and ritual. Typically, however, the focus has been on larger spatial scales (‘landscapes’) rather than urban spaces and buildings. This book brings together contributions from specialists in archaeology, social theory and urban planning who explore the theoretical and methodological frameworks associated with the application of new and established computer-based spatial analysis methods in past built environments. The focus is mainly on approaches that place particular emphasis on the concepts of visibility, movement and accessibility in built space. Registration for the free online course on the “Archaeology of Portus: exploring the lost harbour of Ancient Rome” is now open! The online course is the new exciting project of the University of Southampton and promises to be a fascinating experience for those interested in Roman Archaeology and the application of digital technologies to the study of Roman sites. More details you can find at the project’s website.